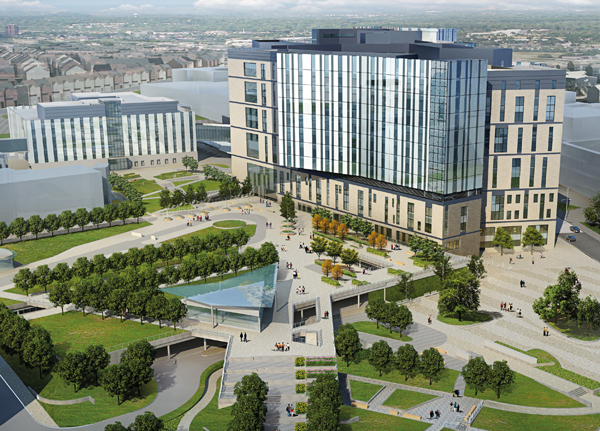 The new Royal Liverpool Hospital will be the largest all single room hospital in the country with 646 beds, including a 40-bed Critical Care Unit, 18 operating theatres and one of the largest emergency departments in the North West. The hospital will be one of the ‘greenest’ in the country, with renewable energy systems, low carbon technology, water meters and leak detection systems. Making a healthcare building more sustainable is key in delivering a future proof healthcare system. Offering a long lifespan and with minimal demands of maintenance, Hepworth Clay drainage has been installed by groundworks contractor Murraywood Construction and will give the Royal Liverpool Hospital a highly durable and cost efficient drainage system that will provide unmatched performance and superior whole life value. Proven in commercial or industrial construction, adoptable sewers, highways and general building works, the Hepworth SuperSleve system is available in 100mm, 150mm, 225mm and 300mm diameters and consists of plain ended pipe and fittings with additional push fit flexible couplings. With a lifetime jetting guarantee, Hepworth pipes are able to withstand jetting pressure of 7500psi, at 20 gallons per minute held static for five minutes, allowing blockages to be cleared with reduced risk and in less time. Paul Wydell, Product Manager at Hepworth, said: “Clay drainage is a genuine fit and forget solution ensuring the hospital’s drainage system will be trouble-free for generations. And with no renovation or repairs anticipated, service costs are as low as its installed risk profile. Clay is also an inert material and chemically resistant – ideal for a hygiene critical hospital environment which requires a drainage system unaffected by almost all chemical attack.